If you're spending a lot of time using Facebook, you may as well get a little shopping done, right? 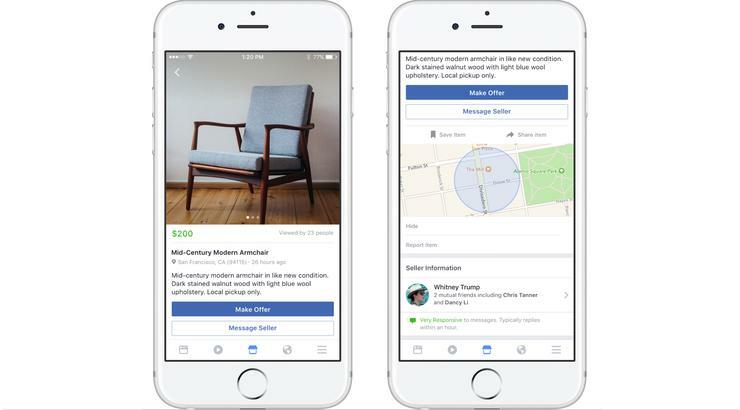 That's the thinking behind Marketplace, a new online version of a yard sale Facebook announced today in a blog post. Marketplace can be found by tapping on the shopping icon on the bottom of the Facebook app for iPhone and Android. The feature is set to roll out to users 18 and older in the U.S., UK, Australia and New Zealand over the next few days, according to the company. Facebook bills Marketplace as a service people can use to find the things they're looking to buy and sell what they want to get rid of. "Facebook is where people connect, and in recent years more people have been using Facebook to connect in another way: buying and selling with each other," wrote Mary Ku, Facebook's director of product management. "More than 450 million people visit buy and sell in [Facebook Groups] each month — from families in a local neighborhood to collectors around the world. To help people make more of these connections, today we're introducing Marketplace, a convenient destination to discover, buy and sell items with people in your community." The move gives sites like eBay and Craigslist, which have made their names and their fortunes on acting like online flea markets, a new rival. "Yeah, this is like a jazzed up Craigslist," said Zeus Kerravala, an analyst with ZK Research. "Facebook should bring an element of trust that Craigslist never had. Craiglist, which has had a problem with scammers, is built on the concept of anonymity, where Facebook uses the concept of community or social network to provide a level or security." Even so, Patrick Moorhead, an analyst with Moor Insights & Strategy, thinks Facebook may have its own issues with trust. "Historically, Facebook has been tone-deaf about privacy," he added. "I'm skeptical this will work, given the perceived creepy factor involved. I mean, let's consider Craigslist and all the creepy things that have happened on that service. And now consider letting those same people near your personal Facebook world." Moorhead noted that Facebook may have to make it clear to users how it will separate Marketplace and a Facebook user's private information. "Given their track record, this won't be easy," he said. Kerravala, though, noted that with the amount of time people spend on Facebook, along with the service's built-in sense of community, Marketplace could be a revenue booster. "I think the other element Facebook brings is spontaneity," he said. "We go to eBay or Craigslist to shop. We go to Facebook to see news and cat videos. While doing that, you might see something that catches your eye.... I think it's a great move for Facebook. People already spend hours on the site, this gives them a reason to spend more."